The Open Referral Initiative is a network of people and organizations working to promote the accessibility of information about health, human, and social services — i.e. community resource directory data. Our Human Service Data Specification (AKA ‘the Open Referral format’) is a data exchange format that enables resource directory data to be shared among heterogeneous information systems. Open Referral’s ecosystem includes a range of open source tools and web applications that facilitate the flow of resource directory information. The the Ohana API is an open source ‘reference implementation’ for the Open Referral format, and Ohana Web Search (for example) is a resource locator website that works with the Ohana API (or compatible APIs). More tools are in development by members of Open Referral’s network, members of which are primarily assembled in our Google Group. Greg Bloom is the instigator and lead organizer of Open Referral, which emerged from work done in the DC Open211 project, and which was first described Towards a Community Data Commons, an essay published in Code for America’s 2013 book Beyond Transparency. Our work was initially co-sponsored by Code for America and the Ohana Project, with funding from the Knight Foundation. There are three types of ultimate stakeholders for Open Referral: 1) people in need of help of some kind (‘help-seekers’) — and 2) people who are in some kind of position to assist such help-seekers (‘service providers’). Another important stakeholder group is comprised of 3) ‘researchers’ — i.e. analysts, as well as policymakers and funders and anyone seeking to understand the patterns of resource allocation in their community. The primary users of Open Referral are people and organizations that aggregate, maintain, and/or deliver community resource directory data — we simplify this by referring to such stakeholders as database administrators. Our objective is to help such database administrators share higher quality resource directory data at lower cost, with the goal of making it easier for people to find such information across a wide array of channels. Read more about each of these types of users here in our User Personas documentation. Open Referral helps people and organizations grapple with the complex problem of maintaining and publishing reliable information about the health, human, and social services available to people in need. Most of our work does not involve writing code. We facilitate collaborative action among institutions that have mutual interest in cooperation. That said, Open Referral is an open network. Anyone is free to use our data specification and tools in pursuit of our shared goals. If you have resource directory data that you wish to make more available — or if there’s an organization in your community that might make its data more broadly accessible, then you could get to work right away. Read more in our Contributors Guide. Reach out to info@openreferral.org to get directly in touch. You can start by testing the viability of our format for your context. 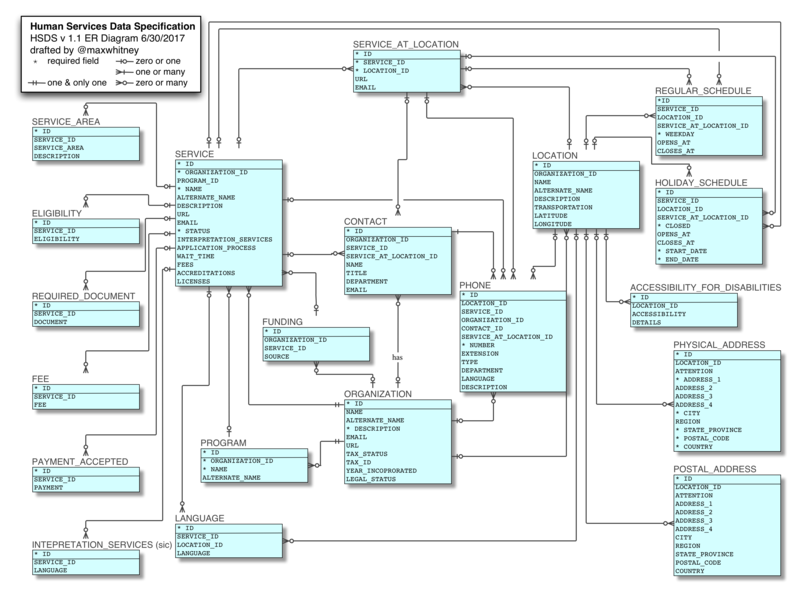 That may entail mapping your database's schema to the Human Services Data Specification. Then you can write a script to transform your data into this open format. Finally, you can deploy the Ohana API, load your transformed data in (loading instructions here), and start building new tools that can help people in your community use this data in new ways. Here are some examples of mapped schema: A comparative analysis of a resource directory from Evanston to an earlier version of HSDS. The humanitarian service data model (more about this project here). The DMV Maternal Mental Health resource guide. Here is an example of a script to transform and load data into Ohana, from Boston’s Helpsteps roject. Read more in our Contributors Guide. Of all the feedback received from many different contributors, we assign priority to the perspectives of the lead stakeholders of our pilot projects. This feedback is submitted to Open Referral's deputized technical leads, who ultimately make decisions with documentation and established methods for future review. For version 1.0, Parafina chose to accompany a more-complex set of CSV files with a JSON datapackage (using the Open Knowledge Foundation's frictionless data specification) to describe the CSVs' contents. Open Referral recognizes the existence of a diverse array of taxonomies to describe types of services, organizations, and people for whom services are available. Given that such categories are inherently subjective, whereas Open Referral's format is describing only factual data, we do not prescribe a specific taxonomy. We do recognize the existence of an array of taxonomies currently in use, and our HSDS format includes specifications for including any taxonomy in open data. The Open Referral format has been developed to require a pretty minimal set of information. If your resource directory doesn’t contain certain required elements, we may need to get creative. Ask in our Issues queue for clarification and context, and we'll try to answer you promptly. Open Referral is working to build tools to help produce and verify accurate resource directory data. If you’re interested in developing such tools — and/or if you already have experience with such tools — we want to hear from you! Please reach out to info@openreferral.org to discuss. We have a network of projects around the United States, Canada, and beyond. See this network map here. You can also see deployments of the Ohana API and compatible APIs here and here. Some groups have adapted our data specification to their context, such as the Human Services Data Model (in the field of Humanitarian Crisis Response). You can contact Greg Bloom (@greggish | bloom@openreferral.org), the chief organizing officer for Open Referral. Oh, do you mean machine language? Our data specification calls for CSV files with a JSON datapackage. Our reference implementation, the Ohana API, is in Ruby. Get in touch with Greg at bloom@openreferral.org. You can also start by finding other people in your community who work with information systems that keep track of the health, human, and social services available to people in need. You could also look through our Issues queue, comment away, and even offer Pull Requests to our documentation with your own documentation of why. It might be a while before we are able to address your issue directly, but your feedback is very welcome as it helps us set our agenda! The Human Services Data Specification is entering an upgrade phase of development, under the interim leadership of the Open Data Services Cooperative. Check out our issues queue. We are seeking sponsorship to support long-term institutional development of Open Referral and our data specification. Please reach out to info@openreferral.org for more information. Human Services Data Specification v1.0 is now available as a CC BY-SA 4.0.